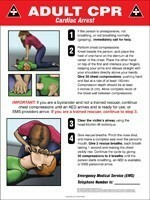 First Aid & AED signs alert others to help when needed. These first aid signs help to direct employees and visitors to your companies first aid kits or first aid office in case of an emergency. Accidents are waiting to happen at your business... when they do, will your employees or customers be able to find first aid quickly? 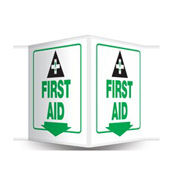 Proper signage that directs employees to first aid stations and medical help can create a safer work environment. Choose the first aid sign you need from the selection below. Our first aid signs can be surface mounted or flange mounted to project from the wall or ceiling. 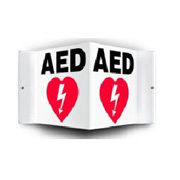 We offer first aid signs and labels in standard finish and glow in the dark. Most first aid signs are available in Spanish and Bilingual formats for the facility with multicultural employees or customers as well. Emergency First Aid Instructions ..Bleeding . Broken Bones ..Burns..Shock ..CPR. 14" x 20"
Emergency Shower- Eyewash Sign 90D 18" x 4"
Emergency Telephone Information Ambulance ..